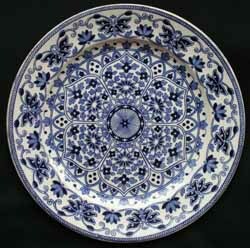 Together with HAWTHORN, this blue & white pattern is one of the oldest in our Booths inventory, dating back as far as 1872 to the firm of Thomas Booth and Son. 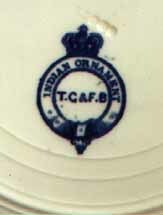 This firm went through a variety of names, the initials of which are found in the centre of the typical 'garter' backstamp (see below). 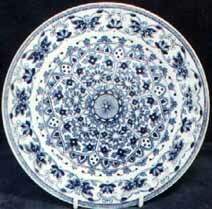 Items are often impressed 'IRONSTONE' and were produced on a heavy, thickly potted body, although whether this is actually genuine ironstone is open to debate and would depend on the chemical composition of the materials used. This mark was used until c. 1906 when Booths SILICON CHINA was introduced. 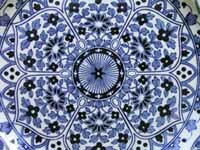 INDIAN ORNAMENT's blue transfer is remarkably detailed and shows as two distinct shades of blue, light and dark. This reflects the depth of the engraving on the copper plate from which the transfer was taken, the shallower areas taking up less blue ink during the manufacturing process. 5 ins high (top of lid). 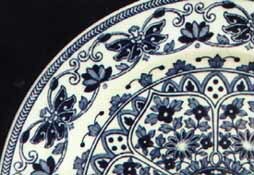 We are currently looking to buy plates and soup plates in this pattern.